The trailhead is located in back of the main park visitor's center. Getting there: From Burnet, head south on US Highway 281. Turn west on Park Road 4 to look for the park entrance on the left after about 6 miles. The Hikes: Longhorn Cavern State Park's main attraction is the cave that gives the park its name. The vast majority of the park's visitors make the trip to tour the cave and spend some money in the well-stocked gift shop. What they largely overlook is the short, but enjoyable, trail system within the park. At an advertised 2 miles, the trails are indeed short, mostly easy but a great complement to the cave tour. Cedar and oak trees predominate in the park and often completely cover the trail. We started our hike at the trailhead behind the park's main visitor center, which also provides access to the cavern. 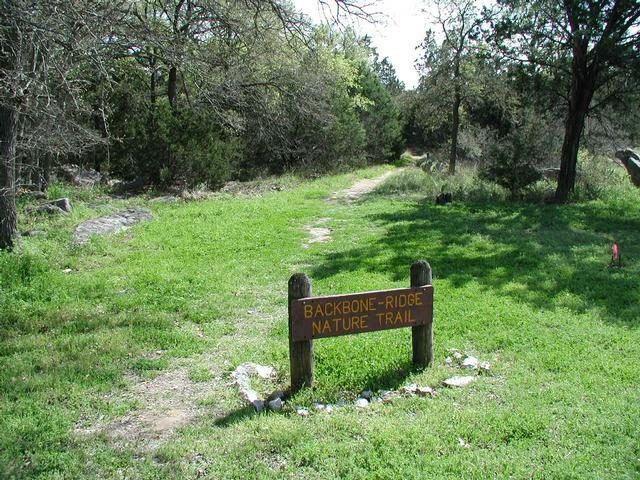 A small sign at the trailhead reads "Backbone-Ridge Nature Trail". A portion of the trail features numbered stations of a self-guided nature tour. A description of the plants described on the tour (which includes a park trail map) is available in the visitor's center. The Backbone-Ridge portion of the hike is well marked and very easy to navigate. Flat terrain and a crushed gravel surface make the trail easy for most anyone to tackle. Much of the park is completely covered in Cedar, usually spreading over the trail and provided some shade from the Sun. Only occasionally do small patches of land open up to the sky. 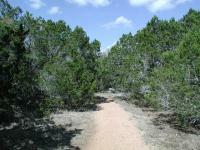 There are occasional breaks in the tree cover along the trail, but heavy cover predominates. In addition to the ubiquitous Cedar, there is plenty of Live Oak, as one would expect in this part of the state. The nature guide provides an opportunity to spot some less common plant varieties and develop an eye for them. The Spanish Dagger, Twisted Yucca, Durand Oak and Post Oak are just a few examples. At the waypoint "3-Min. Loop" a short optional loop forks to the left of the trail. The terrain here is quite rocky, contrasting nicely with the easier main trail. The self guided nature trail does not include any stations in the 3-Minute Loop, but this optional detour will empty right back onto the main trail. The boulder stream appears to be an occassional channel for water runoff. The boulders are washing down too, but at a much slower pace. The next fork in the road presents some options for the length and difficulty of the hike. To the right, the Backbone-Ridge trail empties into the circular driveway of the park that provides the return route to the trailhead. The last few nature trail stations are also found along this portion. Another shot of the boulders, looking 'downstream'. Note the Spanish Dagger plants growing amongst the rocks on the right. To the left the trail the park refers to as the "1 Mile Hiking Trail" extends the hike and provides slightly more of a challenge with its rockier terrain. Whereas the Backbone-Ridge trail was always flat and easy to follow, the 1-Mile trail is rockier and occasionally harder to follow. Look for orange paint on some rocks and trees to help guide the way. We encountered a clearing in the Cedar at the waypoint "Boulder Stream". The elongated opening appears to be a sometimes stream when heavy rains come through. 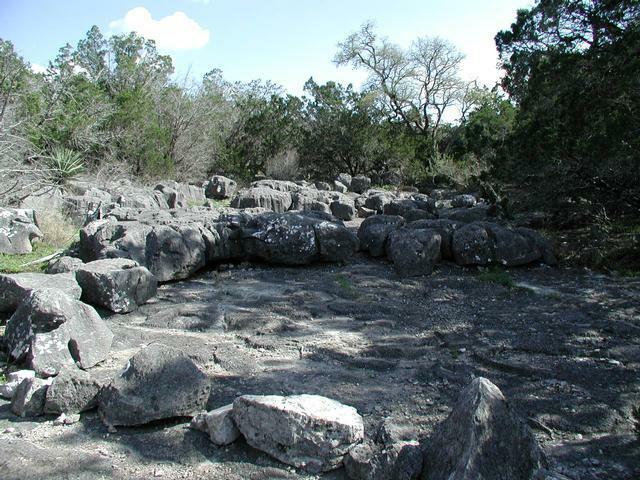 A stream of boulders, all roughly the same height, litters the landscape and appear to be flowing downstream in geological time. 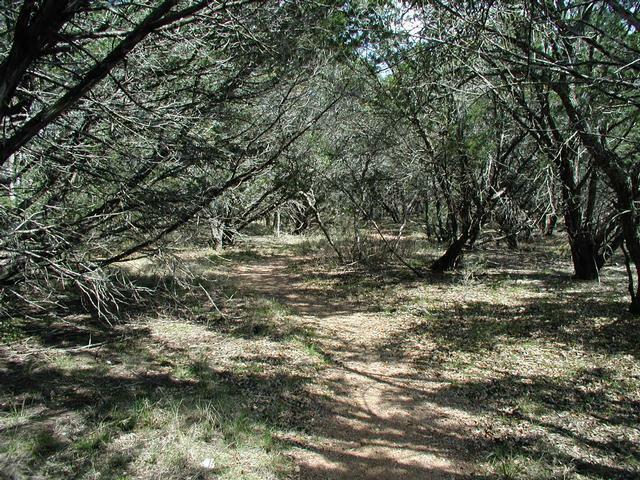 The largest open area along the trail. The trail dumps out onto the circular driveway at the waypoint "CCC House". This small building was constructed by the Civilian Conservation Corps when they were building up the park in the 1930's and 1940's. A short distance away, at the waypoint "Tower", stands another CCC building. The observation tower provides some breathtaking views of the surrounding countryside. We recorded a hike of about 1 mile in one direction, not counting the shortcuts and side trails (shown in blue on the topo map). If you double back to the visitor's center you'll end up covering about 2 miles. The visitor's center is quite nice when compared to many other state parks. The selection of souvenirs and books is larger than one normally experiences and there is even a lunch area where one can gear up before or wind down after hitting the trail. While there is a $10.95 charge to take the cave tour, use of the park's other facilities is free. The nature trail is really a sort of appendix to the caverns, which are the star attraction, but they're worth a stroll, nevertheless. There was a juniper-oak woods as well as a rockier, more open, scrubby section. Interestingly, though just a short distance from Inks Lake, the rocks here are completely different--all limestone instead of pre-Cambrian pink granite. The CCC stonework is always a pleasure, expecially leading up to the caves, but also in the observation tower. 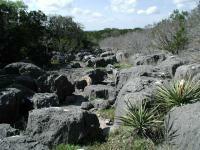 I visited Longhorn Cavern primarily to do the cave tour, but I decided to hike the short nature trails in the park. I was impressed by the cave, but not the trails. Was a nice little loop after the cave. Definitely go up in the observation tower. Not much of a view but nice narrow spiral staircases to climb. Nice little jaunt around the park after taking the caverns tour. The rock river and the observation "tower" were interesting. I imagine this trail would be more fun for smaller kids as it is long enough to provide them with some adventure yet not too long to force the parents to sherpa them out. The trails were easy and short. Lots of trees, but not much scenery to be seen. Hiked with a friend... we were disappointed when we arrived and wanted to hike the caverns, but the only way to hike the caverns is with the guided tour, which costs $12 per person. 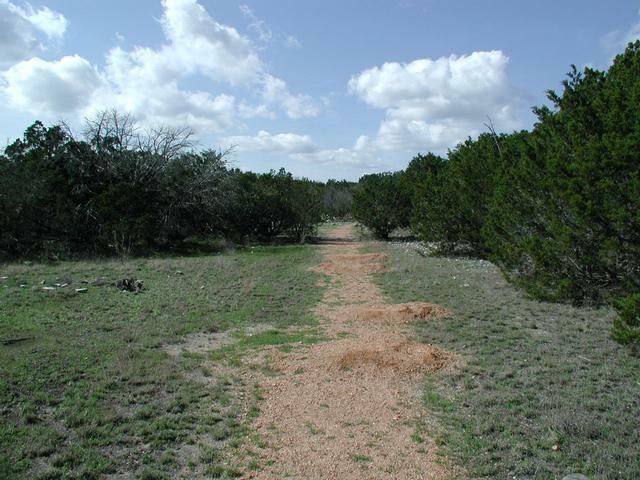 This is an easy trail, and probably not worth the trouble unless you are already at the caverns or you are at Inks Lake. Very quiet, and the trail is well marked. The CCC exhibits and the cave are the main stars of this park, though. Inks Lake Hiking is Near By! 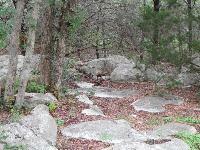 Last i was at Inks lake I discovered that there were trails at Longhorn caverns also. I plan on taking advantage of hiking both location in one day sometime soon! 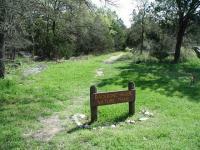 I guess not many people know about these trails at Longhorn Cavern State Park! There was NO ONE on these trails! There is a lot of good hiking here, Geocaching, and history on the C.C.C. A great look out tower, you can climb, to a great view! Try a day trip at this site with your family, you'll love it! Take the Cavern Tour, then enjoy a picnic, and hike in the park! this is a great day trip from Austin!